So it’s no surprise that 64% of marketers want to learn how to build a better content strategy. Tiger Fitness has one of our favourite content marketing ROI case studies. They got a 60% returning customer rate with video content marketing. But even a first-page position is no indicator of success. As Ignite Visibility reveals, half of the clicks in SERPs go to the top 3 results. Finally, to future-proof your content marketing strategy, use augmented reality (AR) and virtual reality (VR). Cisco says the use of these technologies will increase 20x by 2021. You can’t ignore mobile in a 2018 content marketing stats roundup. That’s because this area has developed rapidly in the last few years. than desktops. 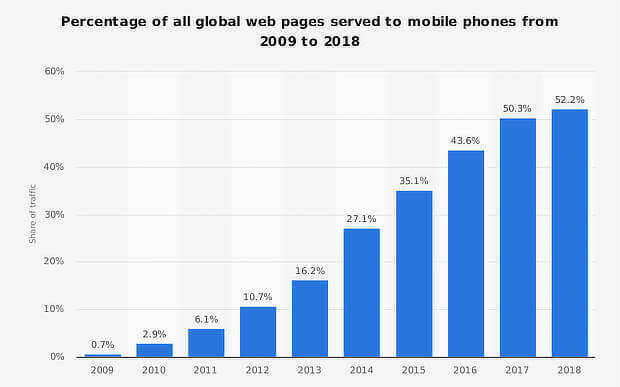 Plus, by the end of this year, 52% of all web traffic will be mobile. But when they land on your site, visitors expect a great experience. In fact, 53% of visitors leave your site if the content doesn’t load in 3 seconds or less. That’s why it’s so important to optimize your site and content for mobile conversions. We’re getting near the end of our content marketing stats roundup. Now let’s look at some ways to share the content you create. We’ll start with email marketing. Then we’ll look at another content marketing channels. The short answer is social media. Social media posts are the most effective types of content for B2C. But it’s not just consumers who use Facebook. Now you have the content marketing statistics you need to support your content strategy decisions and undertake data-driven marketing.